Join us for discovery, inspiration and the chance to connect with more than 1,000 fellow finance professionals when AFG hosts one of our industry’s biggest and brightest events, the AFG National Broker Conference in Brisbane. By attending this conference you will walk away with market and regulatory insights to help you stay ahead of the competition, coupled with practical advice on how to grow your business and employ strategies to help increase business efficiency, profitability and great customer outcomes. It was a catalyst to better performance and a higher level of productivity. It helped reset goals and helped me understand that I’m part of a much larger and complex organisation, with the ability to mix with brokers from all walks of life and locations. Generation of good business practices is likely to result. Whilst the professional development provided is of paramount importance, we know that the superior peer networking opportunities the Conference delivers holds immense value. This is an awesome opportunity to connect, share and collaborate – to exchange ideas and build networks with other brokers, who are all facing similar opportunities and challenges to you. It’s also a great opportunity to make connections with lender partners from more than 40 leading organisations across our lender panel. It delivered some invaluable networking and the chance to make some great contacts. Talking to other brokers and understanding how they are doing in their business helps me. Headlining the Conference are keynote speakers who will inspire and enlighten. Last year, delegates asked for more breakout sessions – and we’ve delivered. You will have the opportunity to register for up to 7 workshop streams – with sessions that focus on holistic client solutions, customer engagement, productivity, optimising your business, strategy development and execution, cyber and data privacy, navigating compliance, your people and their performance and managing wellness and stress. These workshops mean you are able to build an agenda experience that will best benefit your business. The two-night Conference starts on the afternoon of Monday, 12 November and finishes with the closing dinner on the evening of Tuesday, 13 November. You will need to be in Brisbane at the Royal International Convention Centre (Royal ICC) between 12.30 – 2.00pm on Monday for the Conference welcome lunch and registration. The first business breakout sessions will take place from 2.15pm. For our WA delegates, Qantas flight QF650 or Virgin VA465 on Monday, 12 November will get you into Brisbane in time to reach the Royal ICC to register and grab a quick lunch, before moving into the afternoon business sessions. Please note that WA delegates arriving into Brisbane from Perth on Monday 12th, will be able to attend a maximum of 6 workshops over the two days of conferencing. Delegates will be accommodated over the following Brisbane hotels, at the discretion of AFG. Delegate’s accommodation will be advised once registration has closed. A hotel supplement fee is available for those who wish to select and secure their preferred hotel in advance. Please note that registration fee payment will take place at the time of registration, and payment can be made by either credit card or debit card. Card surcharge fees will apply to credit and debit card payments, as follows: VISA and Mastercard: 1.51% plus GST and AMEX: 1.8% plus GST. Make your own way to and from Brisbane and arrange your own airport transfers. Download the Conference app to enhance the way you experience the National Broker Conference. The app is the essential tool to keep you informed on every aspect of the Conference. It contains your personalised itinerary, the full Conference program (including speaker and workshop info), your personalised function access barcode, the delegate listing, an ability to connect with fellow delegates, real time Conference updates and lots more. All registered delegates have now been supplied with their unique password for the app by our conference organisers TRIBE. Check your pre-departure email to locate your personalised app password. If you have any questions about the app, please click here to email TRIBE. The conference allows us to gain a perspective from the outside looking in at our business and was supported by quality speakers and sessions. 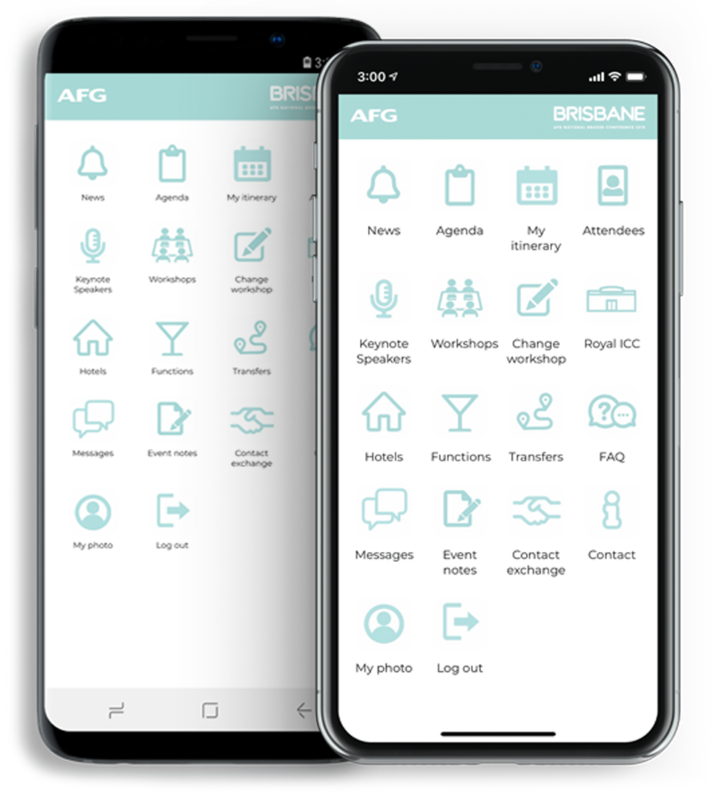 As part of your registration fee, AFG is taking care of the following once you arrive at your hotel in Brisbane: two nights’ accommodation with breakfast, welcome lunch, the first day business session, welcome function, day two business session and the incredible closing dinner. All you need to do is get yourself to your hotel in Brisbane, or to the Royal ICC in time for registration followed by conferencing on day one. This gives you the freedom to arrive when and how you choose. Delegates will take care of their own flight (or travel) arrangements, so start looking now for airline deals or book early using your frequent flyer points. The conference was just fantastic. The social events were very special. I came away feeling very proud to be involved in such a wonderful industry. The Conference is open to all AFG master agents and AFG loan writers, AFG brokers’ support and administration staff, and to AFG lender partners involved in the 2018 Broker Excellence Program. Due to venue capacity, registrations are capped for this Conference. If you have any questions regarding attendees, simply click here. It was amazing to network with other brokers, get updates on the industry and be spoilt for all our hard work. Partner buy-in is available. Partners have the opportunity to purchase a full buy-in package or alternatively to select individual components of the program. Flights and airport transfer arrangements are not included (attendees make their own arrangements). Full partner buy-in is $980. This figure includes accommodation (sharing primary delegate room), two breakfasts, welcome lunch on day one, attendance at the day one and day two business sessions and attendance at both evening functions. Prefer to select individual components of the program for your partner instead? Includes accommodation (sharing primary delegate room), two breakfasts and welcome lunch on day one. Supplement to attend the day one and day two conference session. Supplement to attend welcome function on night one. Supplement to attend closing dinner on night two. Given the small number of Brisbane venues that can take a group of our size, numbers are capped for this Conference, so we urge you to secure your place now. Please be careful to select the correct registration category from the following options. Having moved into broking less than 12 months ago, the opportunity to learn from both peers and the speakers in such a condensed format was invaluable. Please refer to the speaker and workshop section below for information on what we have planned during the daytime business sessions. A detailed business session agenda will be available within the Conference app. Following is a general overview of the program. Please see the speaker and content section for further detail. Tonight we will gather for our opening function, which will take place in a stand-up canape manner, at Brisbane’s home for contemporary culture, a magnificent power station of the 1920s, restored and reborn as an arts centre on the Brisbane River. The evening is the perfect chance to network – to renew old acquaintances and to make new ones. Get ready to step back to a Golden Age of Flying. Our closing dinner will be held in a heritage-listed aircraft hangar. We will spend a special evening dining together in the very hangar that became the home of the fledgling QANTAS airline in 1930. You will enjoy a seated dinner with your industry peers. Important: all attendees must wear their conference name lanyard to gain entry to the daytime Conference sessions (main session and workshops) and both evening functions. The lanyard will be provided during Conference registration on day one. In addition to a main plenary session full of impressive keynotes (with more speakers to be announced soon), this year delegates have the chance to choose 6 – 7 individual workshops that will best benefit you and your business. Please see below information on the 10 workshops you will be able to select from. Attendees will be given the opportunity to register for their workshops, so start thinking about which ones appeal to you. Click on the ‘More Info’ button at each level below for speaker and content information for each workshop. Engaging customers in the digital world. Maximising the value of your brokerage. Setting your strategy for growth. Executing the growth agenda and how to get the job done. What you need to know and what you need to do. How to better equip your business in a changing regulatory environment, with a focus on responsible lending. Lifting performance and culture in an ever-changing world. Managing wellness, stress and 24/7 connectivity. The conference gives you such a balanced approach to your business, confirming you are on the right track, or the ability to grow if that is your desire. I walked away with confidence and inspiration. Why is the registration fee so reasonable? AFG is subsidising the attendance of AFG broker delegates thanks to the generous support of our lender partners. The MFAA and FBAA have allocated a total of 13 CPD points to this conference. CPD points will be prorated if you do not attend all of the above. Delegate lanyards will be scanned for entry into all of these components, and the registered number of CPD points will then be allocated to each person accordingly. Please ensure your lanyard is scanned upon entry to all of your sessions, otherwise you will not be awarded CPD points. Your CPD points reflecting your attendance will then be updated into AFG’s Learn platform (found via the AFG Suite dashboard) by mid-December. Can I extend my accommodation outside of the Conference dates? You sure can! When you register online, there will be an opportunity to extend your accommodation (with additional nights at your cost), simply let us know what additional dates you require, and our conference organiser TRIBE – Travel & Events will provide you with a quote for your additional days. Extensions will be subject to availability. We understand that circumstances can change, and that you may need to cancel your registration or the registration for an accompanying person. Please note the following cancellation policy. Cancellations that occur before 10 October will receive a refund of all fees paid, less an administrative fee of $100. The refund will be paid either to the credit card or debit card originally used to pay the registration fee. After 10 October, the registration fee is 100% non-refundable. This timeframe is based on when our final numbers are due to venues and suppliers. Yes, you can substitute or transfer your registration to another person. The transfer needs to be arranged by you (directly with the person you are transferring your registration to), and payment of the transferred registration fee is to occur directly between you and your replacement delegate. Which hotel will I be allocated? Your itinerary, including your allocated hotel information, will be emailed by Friday, 2 November. Alternatively, please call the event organisers TRIBE – Travel and Events on 03 8578 3151 or email them NBC2018@tribemanagement.com.au and they will provide you with an update. Fill in this form and we’ll get back to you with an answer.